An attention-grabbing subject line, a fresh design and a focused call to action contributed to the overall success of this email campaign. This promotional HTML email campaign was tied in with a Bank Holiday weekend, so after only receiving the client brief on a Thursday, we had to turn around ideas, design and a full build solution quickly, without compromising on quality, effectiveness and impact of the campaign. At Parker Design we have years of experience with HTML email design concepts for marketing campaigns. 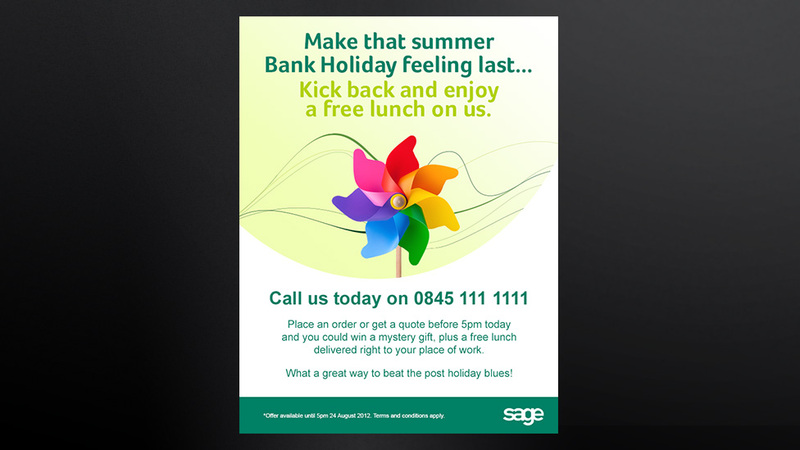 Working alongside our client, Sage, we not only helped with the graphic design concepts and build of the email, we also contributed to the initial copywriting. An attention-grabbing subject line contributed to high open rates, whereas simple yet fresh and engaging design, combined with a clear call to action contributed to the success of this campaign. At Parker we are happy to send email campaigns on behalf of our clients, although some prefer to send the emails themselves, as was the case with this particular campaign. We delivered a fully editable template to our client, enabling them to send the email according to their schedule. Over the years we have created engaging and effective email campaigns for a wide variety of clients.